Damage to two pillar supports for piers on the new Grand Avenue bridge was not as severe as first feared after the unexpected Tuesday night collapse of a section of the old bridge. “We have a repair method, and it appears now that it hasn’t delayed our schedule at all,” said Pat Kalisz, project manager for Granite-Wadsworth, the joint-venture general contractor on the bridge project. A 210-foot span made up of six girders crossing over Seventh Street and the Union Pacific Railroad came down at once around 8 p.m. Tuesday when one of the old bridge piers gave way as crews were using a large backhoe to try to pull a two-girder section away from the pier. In the process, exposed rebar was bent over on two of the columns that will eventually support a pier section south of the Colorado River for the new bridge. Officials were uncertain about the extent of the damage, but work was soon underway to fix the problem. The repair involved using couplers to strengthen the damaged rebar, which one project official said will actually make them stronger. The concrete base sections for the new piers were not damaged, officials confirmed. In fact, one of the piers was scheduled to be poured Friday, Kalisz said. Demolition of the old bridge remains on track to be completed within the 14-day time frame that was originally set aside for the work, he said. Another shorter span of girders crossing over the construction causeway that was built next to the Colorado River was removed overnight Thursday. That work was done using a crane from above to lift the girders two at a time off of the old pier, Kalisz said. The span directly over the river is slated to be removed tonight, with work continuing on a 24-hour schedule through the weekend, he said. 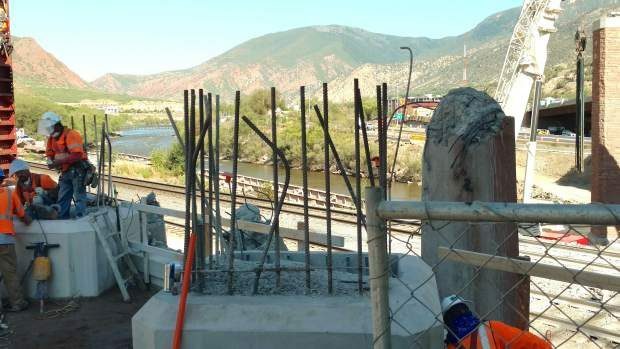 Contractors and Colorado Department of Transportation officials were still assessing any extra costs that would result in the $126 million bridge replacement project from the damaged pier supports. But that, too, was expected to be minimal.